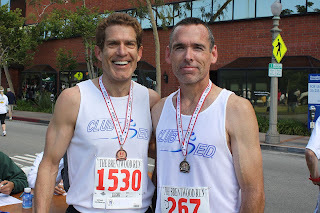 Waking up to a blustery Sunday morning, thoughts of a wind-blown struggle to the finish flashed through many minds…but in Brentwood, the breezes abated and the race was on. 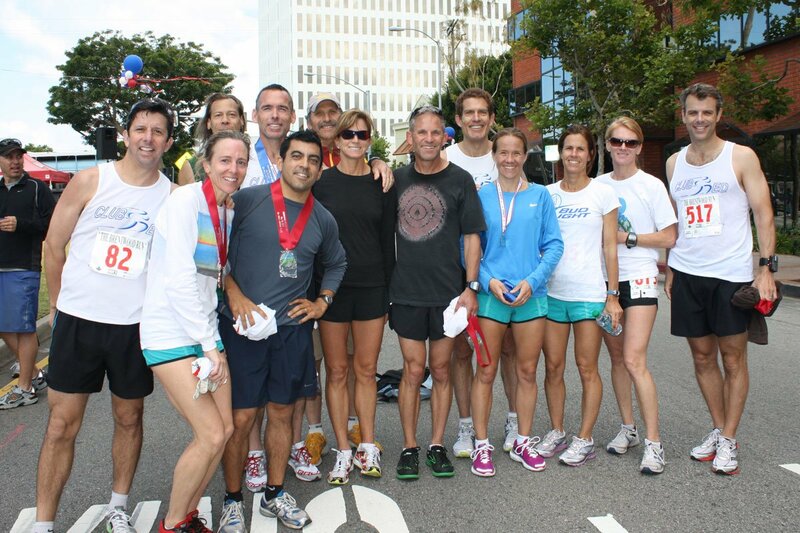 The Brentwood 5K -- fourth stop in the 2011 USATF Club Road Racing Series -- and Club Ed showed up in force to battle the talented Janes, the swift Fluffy Bunnys, a tough TCLA, and all the rest. Almost 20 Club Ed runners were at the starting line, and all ran great (5 age group winners, 3 runners-up, 3 third places, and everyone in the top ten in their age group). Jon Megeff led the way with a 16:31 PR, good for 6th overall – not bad for someone concerned about minimal training the past month or two. Mike Cortez fought his way to 17:00, although his young age will drop him in the age-adjusted club finish (we older guys are sneaky that way!). Rich Gust was in hot pursuit (17:13), and Jeff Bryant PR-ed his way to 17:18. Not to be outdone, our talented women also had something to say… Brentwood saw the welcome return of Nathalie Higley, who ran 17:46, good for 3rd overall woman and 1st in her age group. Chasing her to the finish, Alison Atkinson (17:50) proved she has pretty much recovered from the LA Marathon. Debbie Richardson showed her talent extends well beyond triathlons, PR-ing in 18:39. Emily Anderson continued on her comeback after baby Owen’s arrival, finishing in 19:01. (Owen was there to cheer on his mom, but Coach Ed lectured him on running philosophies, and Owen nodded off out of boredom). In other notable finishes, our own AquaDuck (Steve Notaro) took some time off from WaterWorld, came out to race for the team, and finished strong in 20:56. 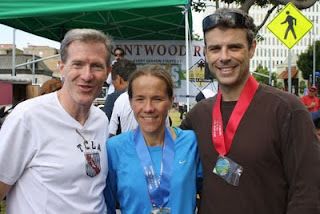 Pat Wickens (22:55) made it clear he is still a competitor, and Sue Reinhardt (26:14) won her age group by 12+ minutes! It will take a little while to see the “official” club standings, but it looks like we had at least five team mates in with an 85% or higher age-graded race, which should be VERY tough to beat…Great job to all!